At the Law Office of Michael D. Cleaves, PLLC, you can expect quality representation in the practice areas of criminal defense, personal injury and workers' compensation. 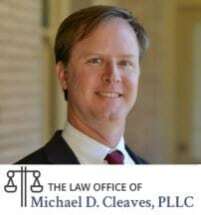 Michael D. Cleaves uses his 15 years of experience, legal knowledge, personal service and track record of success to protect the rights of North Carolina clients who have been arrested, injured in a motor vehicle accident or seriously hurt while on the job. Our skilled attorney knows how to investigate, negotiate and advocate in court, if necessary, when a potentially life-changing criminal charge, disabling injury or workplace accident makes your future uncertain. We regularly represent clients for traffic and criminal defense matters in District and Superior Courts in Statesville, Mooresville, Taylorsville and Mocksville, and in the counties of Iredell, Davie and Alexander. We handle personal injury and workers’ compensation cases statewide. Our lawyer offers a contingency fee basis for his legal services to injured clients. This means that you owe no attorney fee unless our law firm wins your case. Contact us today to arrange your initial consultation. Home and hospital room visits are available upon request.